Rappers A Tribe Called Quest have reportedly axed a trio of upcoming European concerts after frontman Q-Tip sustained a shoulder injury. The Scenario hitmakers have been performing a number of dates in support of their final group album We Got It From Here...Thank You 4 Your Service, and they had been due to head to Denmark for the Roskilde Festival, which kicks off in late June; however, festival organizers have since announced A Tribe Called Quest will no longer be taking to the stage due to Q-Tip's medical condition, and they have drafted in Ice Cube to replace them on the bill. A statement posted on the event's website reads: "Unfortunately, A Tribe Called Quest is forced to cancel three European shows this summer. 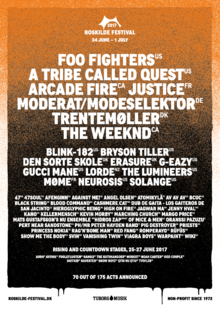 This means that the concert at Roskilde Festival 2017 on Saturday 1 July will not take place. "The reason for the cancellation is that front man Q-Tip recently had a shoulder injury and needs surgery, after which his doctor has ordered him to stay home and rest." The hip-hop veterans, who lost original member Phife Dawg last year, have yet to comment on the news, or the other European shows affected. A Tribe Called Quest are currently still featured on the bill for the Parklife Festival, which takes place in Manchester, England next month (Jun17). It is also not yet known if Q-Tip's injury and recovery period will affect the band's planned shows in the U.S. and Canada this summer. The North American leg of the stars' tour had been due to begin with the Pemberton Music Festival in British Columbia, Canada on July 13, but event bosses have since pulled the 2017 bash after declaring bankruptcy. Chance The Rapper, Muse, MGMT, Haim, and Run The Jewels, had also been slated to perform.